Research indicates that women are more likely than men to be the targets of repeated uncivil behaviors in the workplace. Members of ethnic and racial minorities are also at increased risk of experiencing incivility. Repeated experiences of this low-grade aversive treatment can lead to negative physical and psychological outcomes affecting both the personal and professional lives of the target as well as bystanders and the organization itself. Notably, these outcomes have been linked to job withdrawal, leading researchers to investigate selective incivility as a potential contributing effect of the glass ceiling for women and minorities in the United States. While much research has focused on the perspective and outcomes of the targets of incivility, few investigations have focused on the perspective of the perpetrators of these uncivil behaviors. 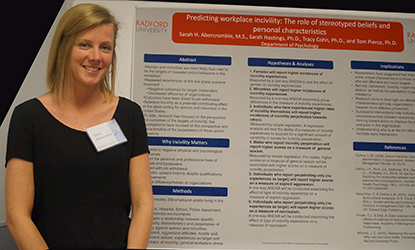 The current research seeks to investigate a relationship between specific personality characteristics and perpetration of incivility against women and minorities. In order to provide a holistic view of the social landscape of incivility in the workplace and to account for the global nature of its harmful effects, information about perpetration and the experience of incivility will be recorded from both male and female participants. Personality characteristics including narcissism, aggression, and sexism will be recorded for both males and females. Implications and suggestions for future research will be discussed.